George Saunders, whose new collection of short stories has just been published, may be the most talented goof-off writing fiction today. More on travel and foreign affairs in Atlantic Unbound and The Atlantic Monthly. Join the conversation in the Foreign Affairs conference of Post & Riposte. "As the Taliban launch a new offensive against opposition forces, the threat which this Islamic regime poses to regional stability has gone unnoticed. Terrorists fighting the governments of virtually every Central Asian power find shelter with the Taliban. An equally dangerous by-product is the criminal economy supported by the Taliban, which spreads weapons and drugs throughout the region." A cover story from the Far Eastern Economic Review. Few governments are as shrouded in secrecy as the ruling Taliban in Afghanistan. Ever since these mysterious bearded clerics emerged from obscurity in 1994 to overrun almost the entire country -- imposing a radical version of Islamic law that forbids women from employment and education, bans entertainment such as card-playing and music, and prescribes severe punishment for men who shave their beards -- they have baffled and frustrated outside observers. 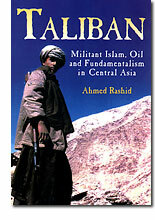 In Taliban: Militant Islam, Oil and Fundamentalism in Central Asia (published this past spring), the Pakistani journalist Ahmed Rashid, who has reported on Afghanistan for more than two decades, provides an insider's analysis of this much-feared, but little-understood, movement. Drawing on years of unparalleled access to Afghanistan and its rulers, Rashid portrays a Taliban leadership that, for all its success, is marked by a surprising level of internal disagreement and ideological incoherence. Yet, as Rashid makes clear, the movement is no less influential for its confusion: perhaps the most important contribution of the book is the light it casts on the geopolitical transformation -- "the new great game," as Rashid calls it -- that is being wrought by the Taliban's rise to power. The conflict in Afghanistan, not merely an internal civil war, has thrown the entire region into turmoil. It has increased the tensions between Sunni Saudi Arabia (which, along with Pakistan, is the Taliban's most important supporter) and Shia Iran (which is determined to protect the Shia Muslim minority holding out against the Taliban in northern Afghanistan). And it has exacerbated tensions on the South Asian subcontinent: the Taliban's support of the insurgency in Kashmir has led to a siege mentality in New Delhi, which sees itself as the bulwark against a steadily advancing Islamic fundamentalism, and makes dialogue between India and Pakistan increasingly difficult. Even China and Russia have felt the potency of Taliban-inspired terrorism in their restive Muslim territories (just last week Russia announced the capture of Afghani mercenaries in Chechnya). Rashid makes a convincing case for the explosive potential of the Afghan situation. Years from now, Kabul may well be compared to Sarajevo, the city that in 1914 touched off a bloody, drawn-out world war. Ahmed Rashid, based in Lahore, Pakistan, is a correspondent for the Far Eastern Economic Review and London's Daily Telegraph and is a writer for Pakistan's The Nation newspaper. Akash Kapur, based in Oxford, England, recently interviewed Rashid via e-mail for Atlantic Unbound. One of the first things I noticed about this book was the access you had as a reporter to members of the Taliban. How did you gain such access? I have been covering Afghanistan for over twenty years, so I know everyone and they know me. But with the Taliban it was different, because when they emerged they were so new to the political scene. In the beginning they were trying to impress and were very accessible. (It is only their leader, Mullah Omar, who has always been totally inaccessible.) Once they met you, once a relationship developed, it was not a problem -- and it's not as if they were flooded with reporters at that time. Only later did they become more inaccessible. Today, gaining access is much more difficult, because they feel under pressure from the West and Western reporters. They were always very secretive about their internal workings, but now they are almost paranoid about secrecy, so it's very difficult to find out what is going on inside the movement. Working with them for interviews and meetings is extremely difficult. You mention at one point being nervous when asking a question about the Taliban's policies on women. How often did you feel this way? Is it frightening or intimidating to meet these people? The Taliban are completely averse to discussing anything about Islam or Islamic law with outsiders, even with fellow Muslims like myself. They think they know it all and have the truth and anyone raising other points, even from an Islamic point of view, is their enemy. Unfortunately, they do not accept even the basis of Islam -- which is about discussion, debate, and relating religion to modern-day realities. They want to recreate the situation that existed in Arabia in the seventh century. Their religious police are very intimidating and don't like foreign journalists wandering around. Generally speaking, though, there is much better law and order in their areas, because they have disarmed the population, so it's perfectly safe to travel around Afghanistan. You don't get harassed like you used to for money, toll taxes, and tips. Did you ever feel personally threatened? I have been threatened many, many times during the last twenty years. I have been threatened by the Communist government, and by some of the mujahideen, such as the former mujahideen commander Gulbuddin Hekmatyar, who posted a death warrant for me in his party newspaper. In another incident, during the Communist era, I and two other journalists spent nine hours one night in a Kabul hotel evading two drunken, armed Communist commanders who were trying to kill us. We were chased from room to room; the staff had fled. But the Taliban have never threatened me physically, or publicly denounced me, or put me on any death list or tried to restrict me. The only time you feel in some danger is when you try and discuss Islam and its application in society with top leaders and senior mullahs. They can get very angry and very aggressive about such questions. Usually the room is packed with other Taliban and the leaders have to pose to appear tough and unrelenting in front of their junior colleagues. You write a lot about the changing geopolitical situation brought about by the Taliban's rise to power. I wonder if you can outline the stake that the rest of the world -- and particularly the U.S. -- has in Afghanistan. Can you make the case for why this is not simply a regional conflict, but one that should have the whole world concerned? The U.S. was the main provider of arms to the mujahideen in the 1980s and then just walked away from the situation once the Soviets had completed their exit from Afghanistan in 1989. The whole issue of terrorism and the presence of foreign mercenaries in Afghanistan is a result of American and Pakistani encouragement of radical Muslims in the 1980s to come to Afghanistan from all over the world and fight a jihad. After the war against the Soviets ended and peace did not come, these militants had nowhere else to go and just stayed on. Today, the U.S. has a "get Osama bin Laden policy" but no effective Afghan policy -- which could help to end the civil war. Afghanistan is now a major regional threat not just because the Taliban are harboring Islamic extremists from more than twenty countries in the Middle East, South Asia, and Central Asia but also because of the proliferation of heroin exports, the sales of arms and other weapons, and the cross-border smuggling which is destroying all the economies in the region. Afghanistan is a black hole sucking in all its neighbors. How do you think the changing alliances in the region will affect U.S. relations with Iran? Do you think that Iran's hostility toward the Taliban regime could encourage a rapprochement with the U.S.? I think the U.S. and Iran have a lot of common ground on Afghanistan, and this issue could prove a catalyst to improve their relations. They are both threatened by the Taliban and want to see peace in the country and a diminishing of the Taliban's power. Officials from both countries have told me they are working together quietly on Afghanistan at such forums as the U.N. in New York and in neutral capitals such as Ashkhabad in Turkmenistan. The jumble of new alliances is fascinating -- and often quite surprising. Where does Russia fit into this puzzle? Russia, along with the Central Asian Republics, is backing the anti-Taliban alliance because it fears the spread of Taliban-type Islam into Central Asia and the Caucasus. The Taliban have recognized the Chechen breakaway republic and now Chechens as well as militants from Central Asia are all finding sanctuary with the Taliban in Afghanistan and fighting for them. You also write quite a bit about the divisions within the Islamic world -- specifically, between the Sunni Muslims of Pakistan and Afghanistan and Shia Muslims of Iran -- created by the Taliban's rise to power. I think this is an interesting point because Americans tend to think of the Islamic world as a monolithic bloc. I wonder if you could talk a little about the root cause of these divisions. Iran has always supported the Shia minority in Afghanistan represented by the Hazara people -- it's a kind of protection of the Shia minorities across the world, a policy the Iranians adopted after the 1979 revolution. Since the mid-1990s Iran has begun to support all the non-Pashtoon ethnic groups in order to strengthen them against the Taliban. Pakistan has always supported the Sunni Pashtoons in Afghanistan. During the 1980s the military regime of Zia Ul Haq supported Sunni extremists who were determined to oust Pakistan's own minority Shia population. So there has been a kind of proxy war going on between Iran and Pakistan with both sides funding and arming their respective Shia and Sunni extremists. It's led to bloody sectarian war on Pakistani soil and has devastated inter-faith relations in Pakistan. How has all of this affected the situation in Kashmir? There are a lot of training camps for Kashmiris and Pakistanis being hosted by the Taliban. They do a lot of their initial battle training by fighting for the Taliban. One extremely unfortunate development over the past few years is that Pakistan's Afghan policy has become hostage to Kashmir, in the sense that Pakistan cannot de-escalate support for the Taliban or moderate its policies for fear of losing bases for Kashmiri militants in Afghanistan. You emphasize the role that will have to be played by foreign countries if Afghanistan is to find peace and a more tolerant government. But I wonder about change from within. Is there a next generation of Taliban leaders that may be less fundamentalist? Are younger members of the Taliban any softer than their elders? There are moderates within the Taliban who want an end to the war, the extradition of bin Laden, and better relations with the outside world. I see a lot of fragmentation within the Taliban in coming months. The movement could split -- which could also result in a lot of bloodshed and an inter-Taliban civil war. I can't see a peaceful transfer of power from the more extremist group under Mullah Omar to the moderates. The new generation is not any less fundamentalist. The opposition is really coming from those tribal groups and clans who are traditionally more moderate about Islam, and who are being disproportionately affected by the sanctions and the continuing war. Those tribes involved in smuggling along the border with Pakistan, those in the drug trade, those who want to educate their daughters or have business interests in Pakistan or Iran -- they are all being ruined by the sanctions against the Taliban and the hostile international environment against them. Can we draw an analogy with the situation in Iran, where a second generation of leaders is tempering the fervor of the revolution? Well, I think that is true perhaps, but such a process took twenty years in Iran, and nobody can afford to wait around that long to see if the Taliban moderate themselves, because in the meantime the resulting chaos in the region will only escalate. The international community is now getting very impatient with the Taliban; if there is a second round of U.N. Security Council sanctions against the Taliban, such sanctions will isolate them completely. Continuing with that analogy, do you think the population has reached a state of dissatisfaction with the Taliban leadership? Initially, as in Iran, the Taliban were seen as saviors. But what's the mood among the general population now? There is a very strong anti-Taliban mood building up within the whole population, especially the Pashtoon population, because of the terrible food, water, and job situation -- much worse now than when the Taliban took over major cities like Kabul. In cities like Kandahar, which they have ruled for six years now, nothing has been done, and public frustration is growing. The severe drought this summer has made the economic and humanitarian situation even worse. But the fact is that there are no better alternatives in Afghanistan. None of the warlord factions look after the civilian population or feel obliged to provide amenities to the civilians under their control. Overall, it's a pretty dire picture you portray. If you had to make an educated guess, where would you expect Afghanistan to be ten years from now? Well, the great thing about the Afghans is that despite these enormous social divisions, nobody on any side is demanding a partition of the country along ethnic lines. All the Afghan factions want to keep the country united and want outside interference to end. That is a very positive attribute -- especially if you compare it to such places as Yugoslavia in the recent past. I hope that spirit will get them to the negotiating table. But it will be a long haul. The first thing that's needed is international pressure on all the neighbors to stop supplying arms and ammunition to their Afghan proxies. If the neighbors stepped back a bit and allowed the war machines inside the country to dry out, then the belligerents would be forced to talk to each other. Where does this commitment to a united Afghanistan come from? Your book talks a lot about the various warring tribes and so on. I had the distinct impression of a fragmented national identity. Afghanistan fought the British and then the Russians under the flag of Islam -- but there is also a strong sense of national Afghan identity, even among the most marginalized minorities like the Shia Hazaras, who have been oppressed for centuries by the majority Pashtoons. The sense of identity also comes from the fact that Afghanistan, unlike its neighbors, was never colonized in the last century and has always retained its independence. That's an important factor in this part of the world where all the other states still have the legacy of colonialism or were carved out as states as a result of colonialism. Akash Kapur is a contributing writer for Atlantic Unbound and a contributing editor at Transition magazine. He has written for The Boston Globe, The New York Times Book Review, Wired, Harper's, and The Atlantic Monthly.